Heather G. Stoltz's Temporary Shelter will move to its last NYC venue - Congregation Shaare Zedek, 212 West 93rd St. Temporary Shelter is in the shape of a sukkah, created by Stoltz and homeless New Yorkers. Join her Monday December 19 at 7:00pm at Shaare Zedek for a discussion about the Jewish texts that inspired the piece and the stories that are inculded in the art. On Saturday, December 24 at 11:00am, she will be speaking with the children about homelessness and the students she met at the family shelters. And after the December 24 service, she'll be available to answer questions about the piece. 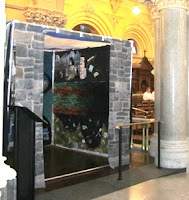 If you want to see the work before Monday, visit the Church of St. Francis Xavier (55 West 15th St, NYC). Can't make it to see the piece in person? You can see all of the art and read many of the stories it tells in her book. 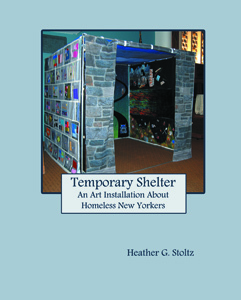 Temporary Shelter: An Installation Piece about Homeless New Yorkers is now available online at Amazon.com and CreateSpace.com. Heather G. Stoltz is a fiber artist with an MA in Jewish Women's Studies from the Jewish Theological Seminary of America and a BA in Jewish Studies and BS in Mechanical Engineering from Lafayette College. Her quilted wall hangings feature themes from classic Jewish texts and social justice issues. Stoltz is the co-president of the Women's Caucus for Art New York Chapter, and her work has been exhibited at many venues including the Park Avenue Synagogue in NYC and JOFA's 10th Anniversary International Conference. She was an Arts Fellow at the Drisha Institute from 2008-2010 and was an Artist-in Residence for the National Havurah Committee in the summer of 2008, where she taught the class "Translating Text into Textile." Her work has also been featured in Jewish Threads: A Hands-On Guide to Stitching Spiritual Intention into Jewish Fabric Crafts, Creative Quilting: The Journal Quilt Project and Zeek Magazine. She lives in New York City with her husband, Geoff Mitelman, who is a rabbi and writer. To see more of Stoltz's work, visit her website at http://sewingstories.com.